The unholy battle between humans and angels has started, with the redband Legion trailer. 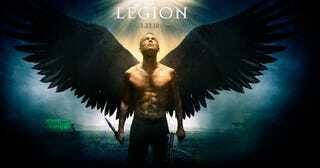 In which gun-carrying angel Paul Bettany chops off his wings, to protect an unborn savior. Looks like a boil-popping good time. First up, the ice cream man, played by Doug Jones, is pretty fantastic, I quite enjoy how he trots over an all fours. The rest of the "must protect the savior baby" is all well and good, but I'm more excited about the Biblical throwdowns and crazy old ladies climbing up the walls. Looks like a delightful over-the-top B-movie fake spiritual war, a la Constantine, but with more blood and guts, and possibly pus coming from Dennis Quaid. I'm sure many, many people will say it's beneath them, but me, I'll be first in line for the Gabriel versus Michael angel battle. Legion will be released in theaters on January 22.